Cleveland—At the Republican National Convention, nighttime is for speeches, and daytime is for protest. On Wednesday, the day’s marquee protest was #WallOffTrump, an action organized by the Latino organizing hub Mijente, as well as Ruckus Society, Iraq Veterans Against the War, the Working Families Party, and other organizations. The groups decided to bring the wall that Donald Trump has boasted about so much to his party’s front door. The immigrant-rights action, entirely peaceful, never devolved into scuffles, while a separate protest that followed later in the afternoon resulted in 18 arrests when protesters attempted to burn an American flag in the same intersection. Dozens of protesters started at Cleveland Public Square, then split up into four groups, marched and met up again at the Quicken Loans Arena, where Donald Trump was formally named the Republican Party’s presidential nominee on Tuesday. Outside the arena, protesters from Ohio; Nevada; Illinois; Texas; and Washington, DC, held hands and stretched themselves out in a line almost as long as a city block. 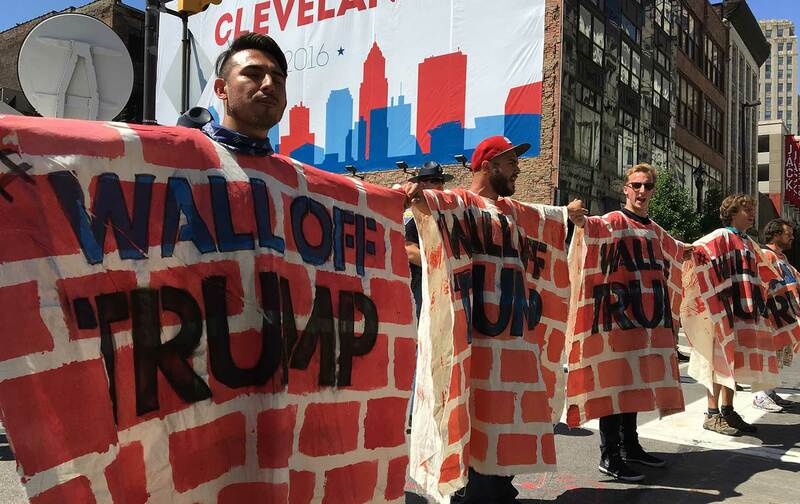 Draped in canvas painted with bricks and adorned with phrases like wall off trump and no mas trumpadas, they actually resembled a wall. Police strategy at Wednesday’s actions was as it has been at every other day’s: to sweep in, typically on bikes and on foot, and fill whatever empty space they can. By forming human chains that limit movement in and out of the protest area, the police turn protesting into a waiting game. It becomes hard to move, and delegates and convention goers outside the action seem, for the most part, uninterested in challenging protesters. At one rare moment, a woman named Janeane Wilson walked right up to the protesters and held aloft a sign that said build the wall. She chanted the same, but few paid her any mind. “I think [a wall] will make us safer,” Wilson, who said she was in Cleveland with the media as a “mom blogger,” told me. “I don’t think it’s hatred. I think it’s just safety.” Wilson lives in Des Moines, Iowa, where, she said, she felt threatened but not exactly by immigrants. “But I feel threatened by people coming to our country who will do us harm. Just look at the crime levels. Look at the terrorist attacks happening.” Her voice shook with conviction, or nervousness, as she spoke, and before I could tell her that crime has in fact declined in the last decade, she turned back to her chants as if to escape our conversation. Protesters didn’t show much interest in challenging her. Gallo reached in to snap photos of protesters, but didn’t stop to share her thoughts with them. There is a lot that’s photo-worthy here. A man with a large beer belly wore a rubber Hillary Clinton mask and a massive yellow sign that said TRUMP or TRAMP. It’s been hot in Cleveland, so he had to periodically lift it up off his head to catch some fresh air. T-shirt sellers have caught on to the RNC’s unofficial slogan, “Lock Her Up,” and there are buttons of all kinds for sale. Trump bobbleheads are going for $20. The atmosphere is already surreal, and everything seems so heightened as it is. Protest becomes just another spectacle. With the exception of occasional skirmishes, which media are quick to chase and police are nearly as fast to neutralize, protests have gone on as such. They start with some nervous anticipation—it does not yet calm my nerves to see dozens of police officers, some wearing goggles and gas masks, marching toward a public square—but generally plateau off into gawking. Media stand around waiting for something (bad) to happen, protesters jostle for breathing space against media who jostle for their angles and clips, and police officers wait for everyone to leave. Eventually, people do. Cleveland police prepared for much more violence than they’ve been greeted with here. That doesn’t mean their presence has not been felt. I’ve seen law-enforcement officers from Indiana, Florida, California, Ohio, and Delaware patrolling the RNC. Sometimes, as during Tuesday’s protest when Cornel West squared off on one side of the corner while people shouted “Police lives matter!” from the opposite side of the square, several hundred police officers run in and first widen and then fill out the gap with themselves. This has seemed to be their primary crowd-control tactic. And Cleveland’s Public Square, the site of most protests, has performed admirably as a venue for public actions. Imagine New York City’s Union Square, or San Francisco’s Civic Center, or the quad of your local college, but fortified by hundreds of fast-moving police officers. Typically, the crowd is a mix of conservative Christians who bring their own step stools to recite Bible verses and warn “sodomites” of God’s wrath; casual spectators, including some who’ve traveled in from Canada to gawk at US political misfortunes; people wearing pink T-shirts that say free hugs; and blithe young people, including those who, after police cleared out of the square Tuesday afternoon, pranced around barefoot in the water fountain as the sun went down. But I’ve yet to see a convention goer stop to contemplate, with more than a passing curiosity, the messages of those who have turned out to make themselves heard.